What AbsoluteBlack is claiming is that in order for the oval concept to work, the largest part of the oval – the part with the highest equivalent number of teeth – must be in the peak power zone. 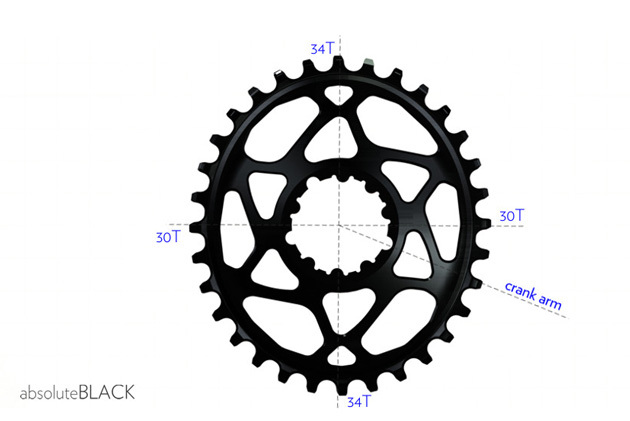 In the case of a 32-tooth oval chainring, the largest part of the oval would have the equivalency of 34 teeth, while in the dead spot, where the crank is vertical, the chain-to-chainring contact would have an equivalency of 30 teeth. This is the case for its latest spiderless oval chainring, the SRAM Oval GXP, which is currently available for pre-order. Oval BCD chainrings are for sale too. Of course engineering something new, or in this case, re-engineering something, is cool, but why bother? The concept is really quite simple: If there’s a point in the 360-degree cycle of a pedal stroke that is producing more than half of all the acceleration and power, then how do you maximize that? Or conversely, if there’s a zone in that cycle that is straining a rider, why not alleviate that point and make it easier? By taking the power of a 34-tooth chainring and combining it with an easier-to-pedal 30-tooth chaining, you theoretically get the best of both worlds: power and efficiency. When pushing a larger gear through the greatest radius of the oval (through the peak power zone) you maximize the output of the stroke, and then your rotation speeds up slightly through the smaller radius (easier gear portion) of the ring, resulting in the amplification of the natural pulsing of a pedal stroke. 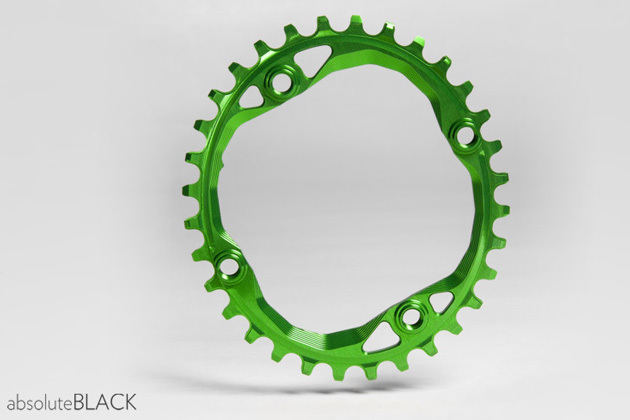 AbsoluteBlack does admit that initially the lopsidedness of an oval chainring feels different, but they say the foreign feeling will subside within a day. But besides the uneven feel to the oval shape, what about the slack/tension of the chain? How does that affect the derailleur? Contrary to intuition, and as seen in the video above, the oval chainring has no effect on a derailleur clutch. And in fact, can reportedly be run on a singlespeed with no chain tensioner.